390 pages | 114 B/W Illus. This new book educates readers about new technologies before they appear in hospitals, enabling medical physicists and clinicians to prepare for new technologies thoroughly and proactively, and provide better patient care once new equipment becomes available. Emerging technologies in imaging, treatment planning, treatment delivery, dosimetry and informatics are all discussed. The book is divided into three parts: recently developed technologies available for practice; technologies under development nearing completion; and technologies in an early stage of development that could have potential radiotherapy applications. 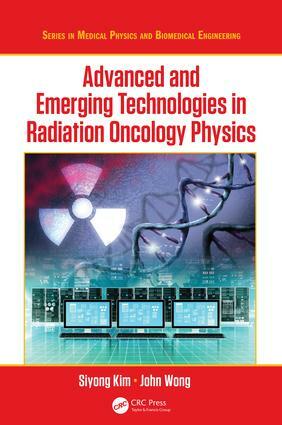 "In this book on advanced and emerging technologies in radiation therapy physics, the focus is on technologies whose clinical feasibility had been demonstrated or technologies with high impact when finally realized. It addresses the growing utility of information technology in radiation oncology with two chapters on informatics. The main intention of the book is to update medical physicists on advanced and emerging technologies, with a secondary purpose of providing important information to both students and researchers that would help them find their research topics and directions. Radiation oncology is a constantly changing field and updates are required for clinical practitioners (physicists and oncologists) in the field. This book has successfully summarized recent developments in most aspects of radiation therapy from simulation to treatment delivery. It is written primarily for medical physicists, particularly research medical physicists who need to be at the forefront of technological development. It will also be an important learning resource for radiation oncologists, residents in radiation oncology, and graduate students and residents in medical physics. Every radiation oncology department should have a copy of this book. The authors are well recognized research and clinical physicists with significant peer-reviewed publications and the contributors are renowned medical physicists…Most physicists would find important material in this useful and timely book. For example, the importance of safety in radiation therapy is addressed in a chapter discussing failure modes and effect analysis (FMEA) checklists and root cause analysis…In all, this is a well written book and I recommend, with no hesitation, that all medical physics departments get a copy for the most current developments in radiation oncology medical physics." Siyong Kim is a Professor and the Director of the Clinical Physics Department in the Virginia Commonwealth University (VCU), USA. Since joining VCU in 2013, he has also served as the Director of the Medical Residency Program. He was educated at Seoul National University, Korea, and obtained a master’s degree in nuclear engineering in 1986. He entered the University of Florida, Gainesville, USA to study medical physics in 1993 and earned his PhD in 1997. Dr. Kim has since performed research in the area of dose uncertainty estimation, patient motion management, and image guidance methods, resulting in over 60 peer-reviewed journal articles and about 150 conference abstracts. He has mentored students both nationally and internationally and served as either a member of Editorial Board or reviewer for 20 scientific journals. He has published 12 book chapters and one report book, and has been actively involved in multiple AAPM and IMPCB (International Medical Physic Certification Board) committees. John Wong is a Professor and the Director of the Division of Medical Physics in the Department of Radiation Oncology and Molecular Radiation Sciences at Johns Hopkins University School of Medicine, USA. Dr. Wong oversees the physics and dosimetry services of the department and his current research focuses on molecular optical imaging for pre-clinical radiation research, robotic ultrasound imaging for IGRT and informatics infra-structure for data sharing in radiation oncology. He is committed to advancing cancer treatment through education, research, and collaboration. Dr. Wong is the primary or contributing author of over 170 peer-reviewed scientific publications and 20 book chapters. He has been a principal investigator or co-investigator on 20 research initiatives funded by public agencies and industries. He is a co-inventor of the Active Breathing Coordinator, flat panel Cone-Beam CT and the Small Animal Radiation Research Platform (SARRP) that have been commercialized as radiation therapy products for the clinical and research community. Dr. Wong is a Fellow of the American Association of Medical Physicists, the recipient of the George Edelstyn Medal from the Royal College of Radiology, United Kingdom in 2001, and the awardee of the Edith Quimby Lifetime Achievement Award of the AAPM in 2017.